In Doom on Thunder Island, Doc Savage and his Amazing Five are drawn into the mystery surrounding the destruction of a New York City skyscraper. 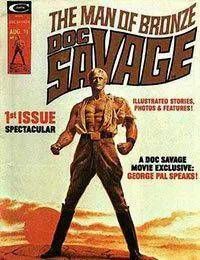 Doc Savages investigation brings him into conflict with a masked madman calling himself the Silver Ziggurat and his deadly manimals.<br />Chris Claremont (Uncanny X-Men) interviews George Pal, who wrote and directed Doc Savage: The Man of Bronze. The publication of this magazine coincided with the 1975 premiere of the film, which starred Ron Ely in the titular role. The article contains still photos from the film.<br />Magazine format, black &amp; white.